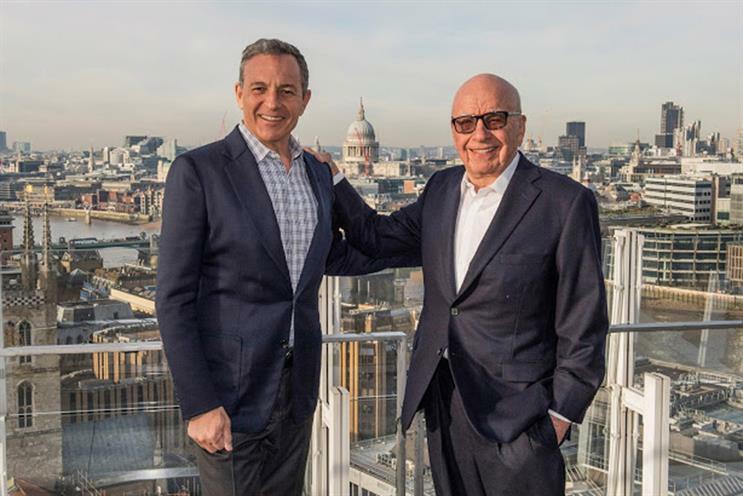 The Walt Disney Company is to buy 21st Century Fox's entertainment assets, including its stake in Sky, from Rupert Murdoch. Disney is buying 21st Century Fox’s film and television studios, cable entertainment networks and international TV businesses in a deal worth $66bn (£49.1bn) – of which $52bn (£38.7bn) will be in Disney stock and the rest covers Fox’s debt. Disney expects Fox to complete the planned acquisition of the 61% stake in Sky that it does not already own by summer 2018, and that Disney would become the 100% owner of the European pay-TV group in due course. The deal will create a "truly global" $210bn ($156.3bn) media giant, according to Disney. Disney was already the world's fifth largest media owner behind Google-owner Alphabet, Facebook and Comcast, and the entire Fox business is the sixth largest media owner, according to a ranking calculated by Zenith in May. It is a watershed moment for Murdoch’s involvement in the media industry. His family will retain control over only a few of Fox’s assets, including Fox News and the Fox Business Network, as well as the separate newspaper business, News Corporation. Disney said buying most of Fox's assets, which also include Star in India, will mean it can "provide consumers around the world with more appealing content and entertainment options" and singled out the ability to "build more direct relationships with consumers" as it takes on the likes of Netflix. The enlarged group will still be smaller than tech giants such as Alphabet, Amazon, Apple and Facebook, which are all valued at over $500bn (£372bn). Disney’s initial announcement did not mention advertising but Sky is a leader in so-called addressable, targeted advertising. Disney’s media networks division brought in over $8bn (£5.9bn) in ad revenues in its last financial year. The entire 21st Century Fox group also had $8bn in annual ad sales. Disney also spends $2.6bn (£1.9bn) a year on its own advertising, and uses Omnicom for much of its media-buying. Fox’s total advertising expense was $2.2bn (£1.6bn), and it has split duties between WPP, Publicis Groupe and Dentsu Aegis Network. Bob Iger, the chairman and chief executive of Disney, plans to stay until 2021 as part of the deal. Murdoch, the 21st Century Fox executive chairman, said: "The new Fox will draw upon the powerful live news and sports businesses of Fox, as well as the strength of our Broadcast Network. "It is born out of an important lesson I’ve learned in my long career in media: namely, content and news relevant to viewers will always be valuable."